These Baked Crab & Cheese Wonton Cups are a lightened up, but just as delicious, version of the classic American-Chinese appetizer. 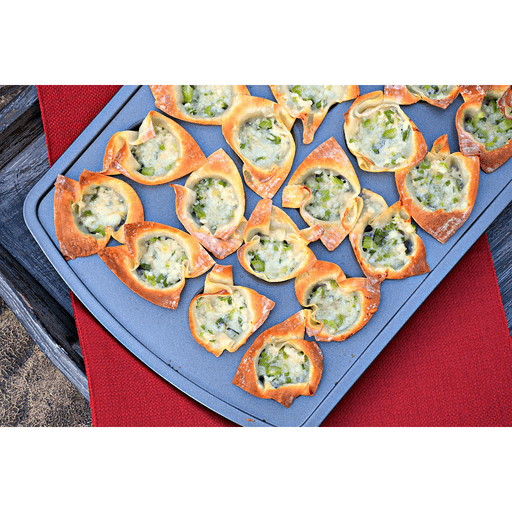 These savory bites are a perfect protein-packed holiday or football party appetizer. 1. Preheat oven to 400°F. Combine the cottage cheese, crab meat, Parmesan cheese, Swiss cheese, celery, green onions, lemon zest and garlic in a medium bowl and mix until well blended. 1. Press wonton wrappers into 15 mini muffin cups sprayed with cooking spray. 1. Place a rounded tablespoon of filling in each wonton wrapper. Lightly spray with cooking spray to coat. 1. Bake on bottom rack for 12-15 minutes or until golden brown. Remove from baking pan and cool 10 minutes. Serve hot with sweet and sour sauce or mustard. Calories 50, Total Fat 1.5g (Saturated 0.5g, Trans 0g), Cholesterol 10mg, Sodium 140mg, Total Carbohydrate 5g (Dietary Fiber 0g, Sugars 0g), Protein 4g, Vitamin A 2%, Vitamin C 2%, Calcium 6%, Iron 2% *Nutritional values are an approximation. Actual nutritional values may vary due to preparation techniques, variations related to suppliers, regional and seasonal differences, or rounding.